Founded in 1981, Sunesta is a pioneer of the awning industry, being one of the first companies to manufacture custom retractable awnings. Our electric and manual shade systems are refined, elegant, and completely reliable, as we strive to provide homeowners and business owners alike with the best awnings and outdoor comfort. With an extensive selection of products in countless styles, we have the ideal shade solutions for any setting, whether you would like a motorized awning to cover your patio or a manual roll up awning for a large dining area or storefront. Sunesta’s retractable patio and deck awnings allow you to engineer the perfect day. Enjoy the sunshine when you want it and create shade when you need it simply by turning a handle or pushing a button. 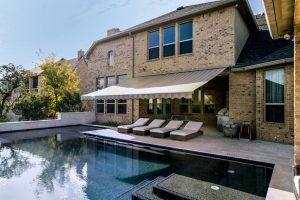 Our awnings don’t need vertical support poles, so you will be able to enjoy a full, open view of the outdoor space around your home while under your canopy. Plus, we have a huge selection of optional features, including wireless remote controls, automatic sensors, and more, so that your awnings can function as precisely as you want them to. Sunesta also makes custom window and door awnings. These shade systems are ideal for shading your home or business during the hot summer months and can even reduce energy costs by keeping excessive sunlight out. Plus, they can be retracted in the winter to allow the sun to hit the window panes, keeping your building warmer. All of Sunesta’s products are 100 percent custom manufactured in the U.S. Unlike other residential awnings that are mass produced and sold in generic styles, Sunesta Awnings are always made to order in sizes that precisely match the respective spaces they are going. Additionally, we have more than 150 fabric options available, including solid colors and striped patterns. Sunesta’s mildew-resistant, synthetic awning fabric resists fading and running because it is solution dyed. You can even select from a variety of frame colors for your awning, making it easier to find a look that will complement your home. 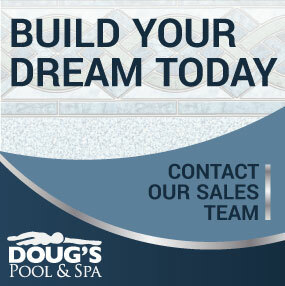 Doug’s Pool & Spa has installed over a 1,100 pools, with decades of experience. Providing retail customers with pool installation, service, products and much more.